This lovely Sperm Whale's tooth is scrimshawed on both sides. The front shows a portrait of the barkentine William G. Irwin, built in 1881. On the back is scrimshawed the name of the ship (Click on insert). Around the base of the tooth is scrimshawed a 'never ending' rope. This tooth is done in black ink with some very light color. It is 3 1/2 inches long and 1 5/8 inches wide at the base. This is a legal tooth, registered with the U.S. Department of Commerce as #21-213-0001. 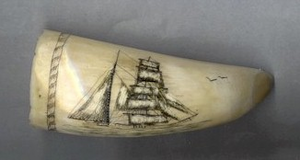 The "William G. Irwin" tooth will make a wonderful addition to any scrimshaw collection - and a great gift! A scrimshawed Sperm Whale's tooth has long been prized as the ultimate American heirloom nautical gift. There is a very limited supply of legal teeth, and this supply is diminishing rapidly.